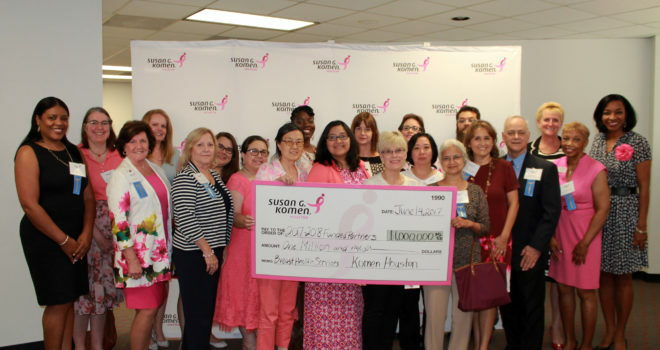 HOUSTON (June 15, 2017) – Susan G. Komen® Houston, the local affiliate of the world’s largest and most comprehensive breast health organization, today announced $1 million in new community grants for 2017. To help achieve Susan G. Komen’s bold goal to reduce current breast cancer deaths by 50 percent in the U.S. by 2026, Komen Houston annually funds local projects to help meet the most critical needs of the community, including projects that provide vitally needed breast cancer screening, diagnostic and treatment services and support, including patient navigation, education, medical supplies and financial assistance. Breast cancer is the number one cancer diagnosed in women and, in 2017 alone, 40,000 women in the U.S. will die from this disease. To put it in a local perspective, 3,100 women in the greater Houston area will be diagnosed with breast cancer and nearly 600 of them will die from it. Komen Houston is committed reducing the number of breast cancer deaths. 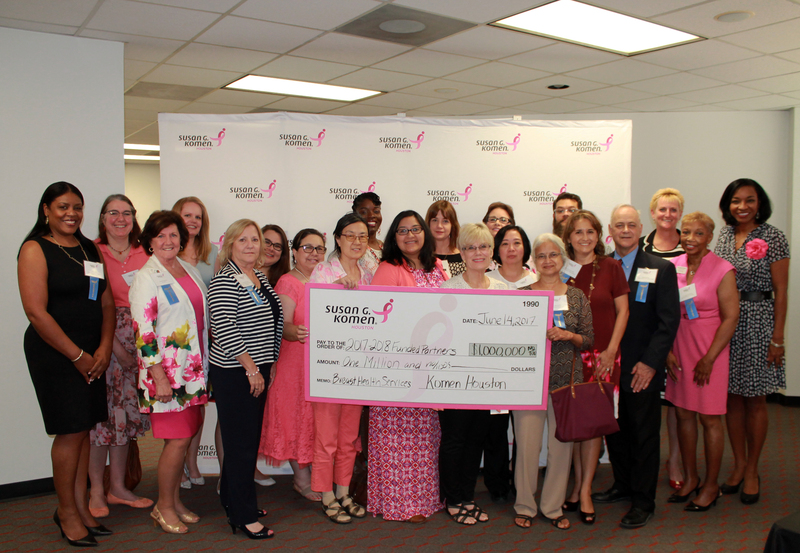 Komen Houston on Wednesday hosted a reception to honor the 2017-2018 funded partners. This brought together members of the Komen Houston Board of Directors, Medical Advisory Council, volunteers, sponsors and funded partners to celebrate our efforts to reduce breast cancer deaths in the community. The Transportation Project provides transportation to breast cancer patients who need assistance getting to their treatment. The Phoenix Project provides breast cancer education, screening and patient navigation services for underserved women. Pink For Life: Facilitating Breast Cancer Prevention and Treatment in Underserved & Minority Women Project provides funding for patient navigation for those seeking services at Smith Clinic. The Breast Cancer Care Project provides screening and diagnostic services to the rural population in Chambers County. The Health Awareness and Promotion Program provides education, patient navigation and screening services for Vietnamese women in Harris, Fort Bend, Galveston, Chambers and Brazoria counties. The D’Feet Breast Cancer Mammography Project provides screening and diagnostic services to underserved and uninsured women who reside in Galveston County. The Navigators to Success Project provides patient navigators to ensure prompt care for underserved women seeking breast health services at Harris Health System. The Liberty County Breast Cancer Outreach, Screening and Diagnostic Project provides breast cancer screening, diagnostics and treatment to uninsured and underserved women. The Hospice Care for Unfunded Breast Cancer Patients Project provides hospice care for uninsured or underinsured breast cancer patients. The Houston Methodist Breast Health Initiative Project provides screening, diagnostic and treatment services for medically underserved women in the greater Houston area. The Indian American Breast Cancer Project will provide education and screening services to underinsured and underserved Indian American women. A Patient Navigation Protocol to Increase Asian American Women Access to Quality Breast Health Services Project provides education and screening for underserved Asian American women. Lone Star Community Health Center, Inc.
Project Pink provides screening and diagnostic services to uninsured and underinsured women in Montgomery County. Project Mammogram provides screening and diagnostic services to medically underserved, low income individuals living in Harris, Montgomery and Liberty counties. The Fort Bend Country Breast Screening Project provides screening and diagnostic services to low income women age 40+ living in Fort Bend Country. The Survivors Offering Support Project improves the quality of life for breast cancer survivors by providing support services. The Saving Our Sisters Project provides patient navigation, screening and diagnostic services to minority women, homeless women and LGBTQ community. The Spring Branch Breast Health Project provides screening to underserved women. The Continuum of Care for Breast Health Project provides a full spectrum of breast healthcare for a diverse group of women in Brazoria, Chambers, Fort Bend, Galveston, Harris, Liberty and Montgomery counties who are uninsured or unable to pay. The Komen Complete Care Project provides screening mammograms and diagnostic services to uninsured women residing in southeast Texas. Since 1990, Komen Houston has funded $39 million to community projects serving local women and men, while contributing $14 million to Komen’s national research grants program. “We are so thankful for the friends, family and neighbors who fight alongside us, helping to reduce the number of breast cancer deaths in Texas, both on the ground and through research,” said Emelda Douglas, Executive Director of Komen Houston. Texas’ uninsured rate remains the highest in the nation and ranks 34th for mammography screening rates. Every day, three cases of breast cancers are diagnosed at later, harder-to-treat stages in the Komen Houston seven-county service area. Susan G. Komen is the world’s largest breast cancer organization, funding more breast cancer research than any other nonprofit while providing real-time help to those facing the disease. Komen has set a Bold Goal to reduce the current number of breast cancer deaths by 50 percent in the U.S. by 2026. Komen was founded in 1982 by Nancy G. Brinker, who promised her sister, Susan G. Komen, that she would end the disease that claimed Suzy’s life. Komen Houston is working to better the lives of those facing breast cancer in the local community. Through events like the Komen Houston Race for the Cure®, Komen Houston has invested $39 million in community breast health programs in seven counties in the Greater Houston area and has helped contribute to the more than $920 million invested globally in research. For more information, call 713.783.9188 or visit komen-houston.org.